*reaches into your pockets and pulls out ashes of hopelessness* Too soon? Okay, okay, I’m not calling you broke, but let’s just say you haven’t quite figured out how your blog can pay all your bills yet. And I’m not going to act like monetizing a blog is the easiest thing in the world either. In fact, I recently learned at a conference that I’m in the 1% of travel bloggers who make a full-time income from their blog. Crazy! So while it’s not impossible, the majority of people who start blogs, won’t ever make much money from it. And that’s not being pessimistic, it’s just stating facts. BUT! That doesn’t have to be you. Because hey, you’re reading this article and ready to take accountability for where you’ve fallen short. 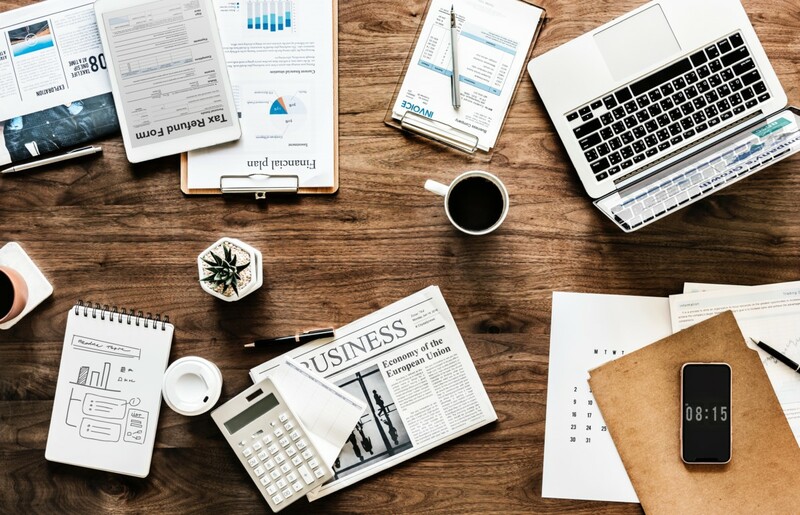 I truly hope this blog post can help break down ways you can restructure your approach to start making a few bucks on the side! I get it, I truly do — Imposter Syndrome is real! 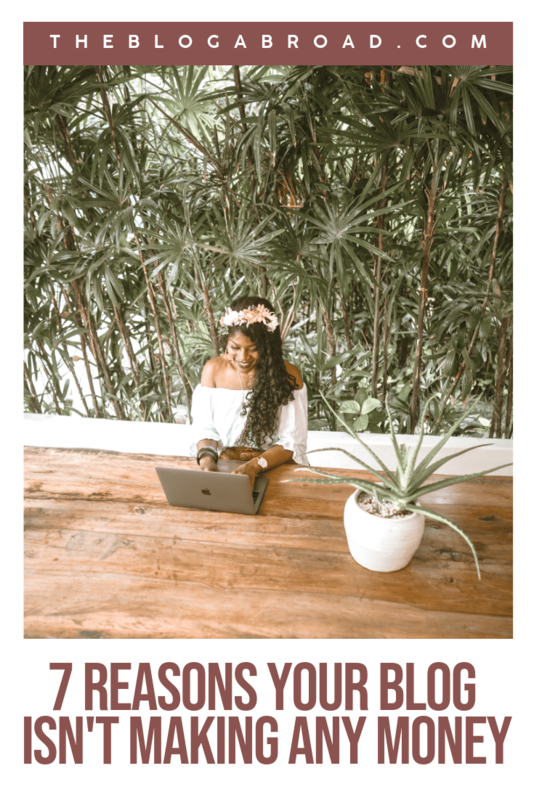 You’re afraid to call yourself a blogger because that means you’ll be lumped into the category of people who stare at their screens for 16 hours a day, make money in shady ways, or don’t have a real job. And these are just the assumptions from my mom, ha! But don’t worry, I only sometimes cry about it at night while overlooking a rice terrace in my $30 luxury villa. But until you brand yourself as a blogger or an expert in whatever field you’re blogging about, people won’t take you seriously, and brands for sure won’t see you worthy of investing in. Book a professional photographer and schedule a branding shoot. 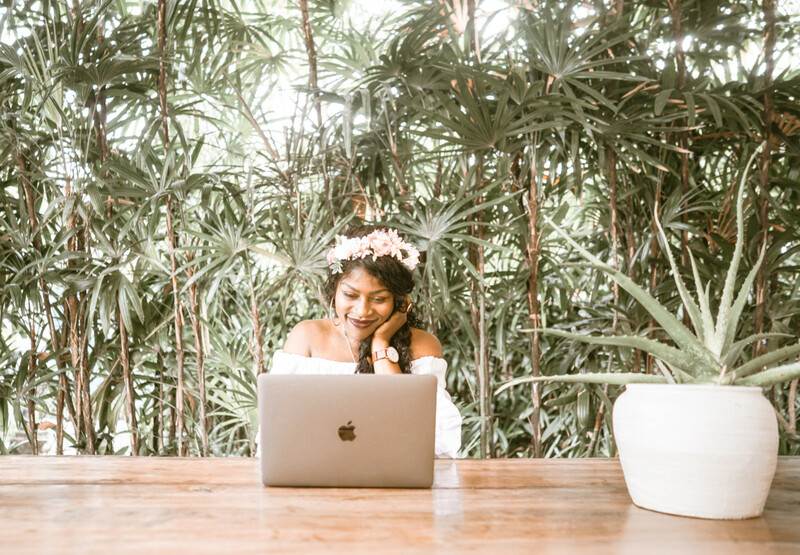 The very first thing I did when I started my wee travel blog back in 2013, was hire my dear friend Joee of Moments of Grace Photography for some branding photos, so that when I published my first blog post, I had some sessy @%$ pictures to post with it. Not only that, but looking at myself through a professional lens did something to my confidence. It made me feel SO official. I finally saw myself as a real blogger for the first time, even though I had been blogging since I was 11. 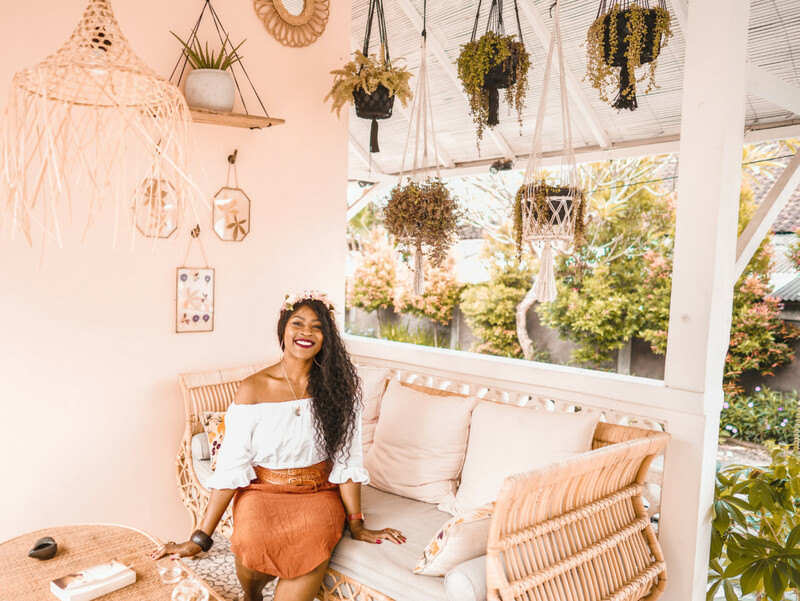 I was no longer someone with just a hobby — I was ready to take this industry by force, and I look back now on the 6-figure blog I’ve built and know that it was these small, but mighty leaps of faith and investments I made in myself to get here. 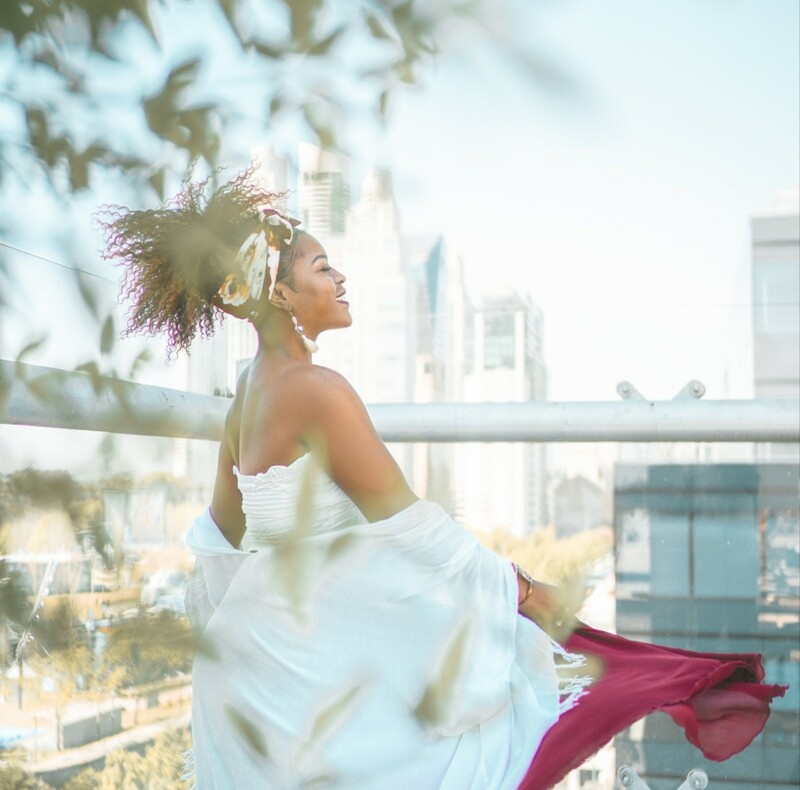 I don’t know what city you’re reading this from, but I know some amazing photographers who are down to travel to you for your session if your budget allows. They are grade-A and Glo-approved: Brianna Mills, KaSandra Mitchell, Erin Sullivan, Dakota Adan, Antoine Braxton, Garvin Reid, and Derio Ilari, just to name a few! It surprises me how many blogs exist without any type of Work With Me page. A brand will never land on your blog and just assume the type of services and deliverables you can offer. Especially when you have nowhere on your site that states this. Good branding is the goal and monetization is the byproduct, because when you have a polished online presence, opportunities will start coming to you. 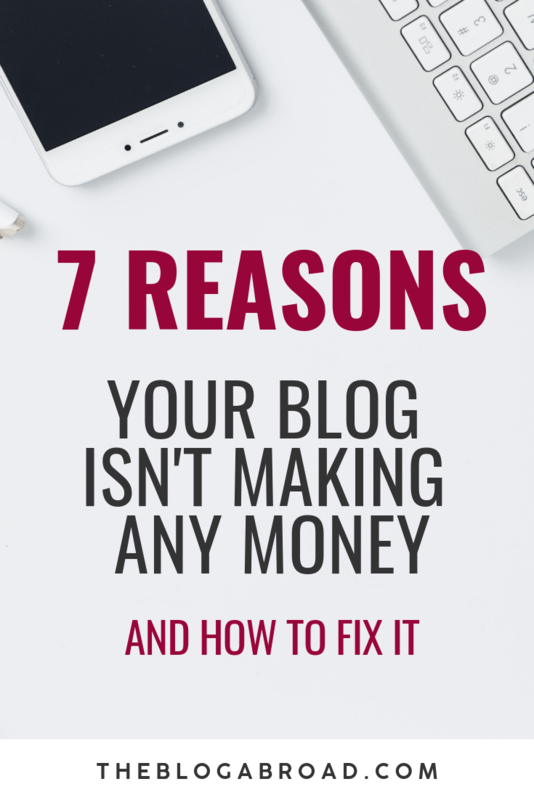 The first misconception I want to bring up, is that most people think there’s only one way to make money through a blog — through ads or affiliate links. And while the ads you see in between my text now are definitely a nice supplemental paycheck each month (feel free to click them and pad my pockets), it’s barely a drop in the bucket for the endless ways you can monetize your blog. Make a Work With Me page, even if it feels super basic. Just get something up in the meantime and prettify it later. Next, go to the websites of all the brands and products you’re already using, and scroll to the very bottom of their home page. Look for “Affiliate” or “Partner” links and apply! Most don’t require a minimum threshold of monthly traffic; you just need to have virtual real estate and you’re good. The most common affiliate program is probably Amazon, and though it takes having a decent-sized audience, there are skirts, tripods, and cameras people have bought through my links in the past that have collectively earned me thousands of dollars over time. I’ve made $2K off of THIS skirt alone! It’s insane! Again, this is money you make in your sleep! Set the link up once and earn forever. It’s like magic! I know this seems so far-fetched when your first earning report amounts to 62 cents. But I promise you, if you build up a reputable brand, recommending ONLY quality products, and you’re constantly bringing value to your audience, that 62-cent paycheck will soon turn into $620. If you’re really serious about bringing in a couple thousand dollars each month from affiliate marketing, I highly recommend you take the course: Making Sense of Affiliate Marketing. I’ve spent thousands on courses and seminars over the years, and this was not only one of the cheapest courses I’ve ever taken, but the most helpful. Michelle truly knows her stuff, and the woman brings in six-figures every MONTH. I know — no need to say it. Beyond affiliate marketing, you can write your first e-book, offer a service like freelance writing or photography, or on the more advanced side, when you feel ready, start pitching yourself to write and create sponsored content for the companies you already use and love. There is no magic number of followers to wait on before you start pitching either. The magic comes from you owning your craft, knowing your content has value, and working every day on improving it. If I told you that out of the 100+ bloggers I met at my first travel conference, only 12 are still blogging today, what do you think that tells you? Most people give up on their blog before even giving it a proper chance. The average blog lifespan is just six months. If a blog were a baby, most people wouldn’t even be able to carry it to full term. Imagine how much you grow when you work on improving your writing or photography every single day? Just imagine. If you think you can write three semi-decent posts and expect sponsors to be in your inbox the next day, you’re in for a short and disappointing ride (that’s what he said). And it should go without saying, that if you’re blogging strictly for the money, then you’re definitely in the wrong business. You should love the idea of providing value to your readers more than the money you could make from it. Some of the most successful bloggers today aren’t even the most talented or skilled at what they do. They just stuck it out the longest and gained success by playing the long game; avoiding tacky trends and just being consistent. 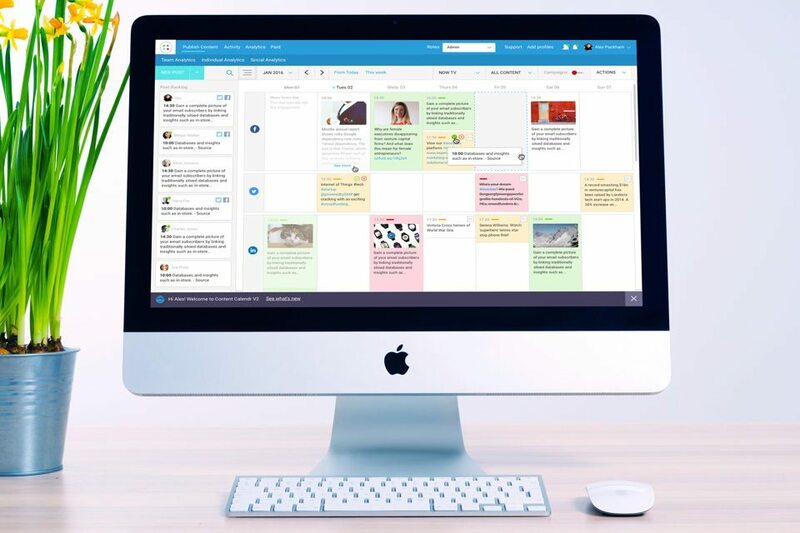 Make a content calendar. This article highlights some of the best software in the game for that. I personally use Content Cal because I love how user-friendly the desktop interface is, like the photo you see above. I’m a visual person, so when I can see that I have XYZ content pieces scheduled for the next few days, I’m more inclined to work on them and not forget! Have you ever landed on a blog that looked like it could’ve been written by a toddler’s left toe? Maybe that’s a bit generous. But they had horrible grammar. No personality. Lacked detail. Just overall horrific. On Friday, we landed in Panama. It was beautiful. Next, we went to our hotel. So fancy. I was really hungry. Thankfully, food soon arrived. Hello, 3rd grade, yes, I’d like to file a plagiarism report. This was clearly stolen from an 8-year old’s diary. Again, slightly insulting to 8-year-olds everywhere who are capable of stringing basic words together to form coherent sentences. But it was sooooooooo cringey! The worst part — it was a SPONSORED POST! If brands are shelling out hundreds to thousands of dollars for subpar content, it means YOU, with the actual SKILL, have the ability to get a piece of that pie! Now let’s take this same information and transform it so that you actually bring personality to your blog’s content. After drooling on the shoulder of a woman who I quickly learned wasn’t too pleased about her new puddle souvenir, I woke up with excitement as I felt the plane landing. AT LAST! That 14-hour flight felt like a lifetime ago, but it was worth it when I spotted the palm trees in the distance, which meant one thing. WE HAD FINALLY MADE IT TO PANAMA! Could you visualize me drooling? The poor woman next to me? Could you see my beaming eyes? And what about the palm trees? In the age of non-stop visual media, it’s your job as a blogger, to paint pictures for your audience. Don’t just say how you’re feeling, describe it! Because once you find that unique voice within, people won’t care how many articles are written about Bali. They’ll seek YOU out for your unique take on it — and that’s how you know you’ve hit gold. There’s nothing worse than publishing a blog post and all of two people read it — one, your grandma, bless her heart. And two, your best friend, who gives you the obligatory heart-emoji reaction in support of anything you post. Bless her heart too. Other than that, you don’t really have a direction for your blog because you don’t even know who’s on the other side reading it. The best place to start is to write what feels good to YOU. Write things you feel like you’re an expert at. Write about topics that bring you joy, pleasure, and make blogging fun! Even better — write content that doesn’t yet exist! Have you ever Googled something and it led you nowhere? Write the content that Google would rank you for. Because when you start with that, your tribe will follow. But it’s important to understand that when you get to a point where you start to sell digital products, courses, e-books, etc, people aren’t just investing in the product. They’re investing in the PERSON behind it. People buy from those they feel connected to. You could create the most bomb thing in the world, but if you haven’t taken the time to nurture your audience and provide value with your free content, no one will lift a finger to purchase a thing. It means you’ve got the marketing and the message down, but you haven’t built an audience that cares. Piggybacking off the last point, let’s say you’ve written your first blog post and you’re ready to announce your new venture to the world! One of the biggest pieces of advice I tell to any aspiring blogger, is to create at least 10 pieces of content before announcing the launch of your blog. Why? Any time you start something new and exciting, your friends and family rally behind it in full support! You’re excited, they’re excited — whoop whoop, we alllllls excited baby! 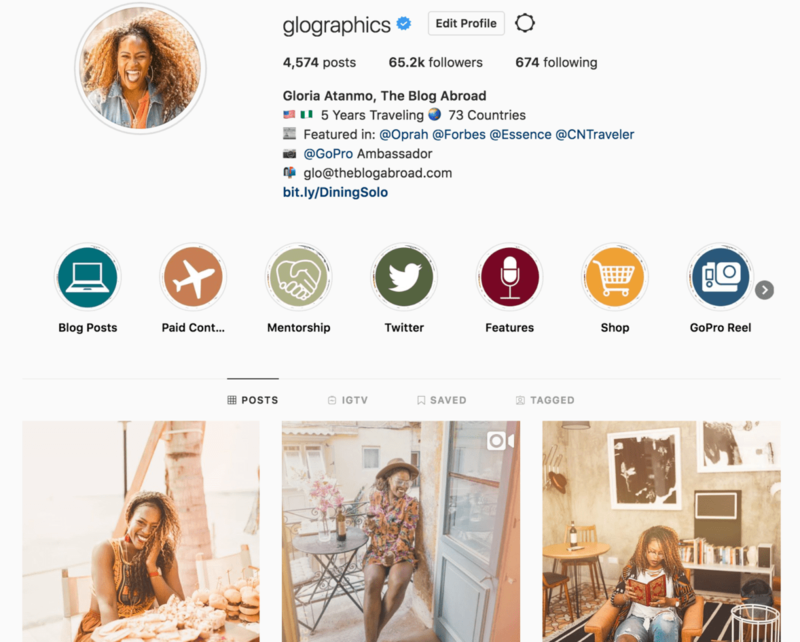 Your first post is live, it gets amazing engagement, and it feels so rewarding! But then what happens? You go to write your second post, and all of a sudden the pressure to top your first post weighs on you. Nothing you write feels good enough. You question everything. You’re no longer motivated. A week goes by. Then three. Then four months. All of a sudden, that blog is an afterthought and people won’t even remember you started it. Write those 10 articles and find your state of flow. Dedicate a couple days each week where you just crank out hours of content, blogs, and social media posts. You allow yourself the peace of mind to write freely and effortlessly and then schedule out a “new” post every two or three days once you’re done. You have to remind people your blog exists or they’ll quickly forget. And to build traffic the SEO way, I use Keysearch to see what sites rank high for specific keywords, and you can also see where your blog comes in comparison. The tools for excellence exist! You just need to meet it halfway. But don’t rely on willpower alone. You need a system and strategy too. It takes money, to make money! My monthly business expenses are around $3,500. This is spent on services, tools, mentorship, courses, admin, and all the other unsexy aspects of running an online business that probably doesn’t blend well with my Instagram aesthetics. Why would I pay $200 to hear a bunch of strangers talk on stage? I saw ZERO value in going. Of course, two things were getting in my way of growth, and I quickly learned to silence them — EGO and IGNORANCE. You know what happened a month after I went? I had my first $1,000+ month of blog earnings. All it took was finally seeing and understanding my value, learning how the industry worked, and forming those relationships that would lead to bigger paying gigs. Not to mention, I even won 20,000 miles from Turkish Airlines from a super random drawing, as there are often sponsor tables set up at these conferences for you to pitch and network with. I got to meet who I consider is the leading travel blogger in this industry — Nomadic Matt, who has now hired me to speak for a second time at TravelCon, and it was his blog I spent hours perusing that helped me navigate my earlier travel days. I partied on tables with BBC Travel Host Mike Corey and quickly learned that I could never out-drink a Finn like Veera Bianca, as we danced the day away on a sponsored catamaran cruise. There’s so much fun and so many friendships built at conferences, because at the end of the day — these people become your colleagues, they are NOT your competition. And it’s through collaboration and support that you both will succeed. Plain and simple — invest in yourself. Take the leap. You guys are soooo lucky to have countless resources available now. Five years ago, the travel industry was so secretive about how to make a living with your blog and monetize your brand. And to be frank — most people either have extra time or extra money, but rarely both. You can decide if you want to be the person spending weeks trying to teach yourself something that you could learn in a few minutes with an expert’s help. And now that you’ve finished this post, and you’re feeling more pumped and inspired than ever, you’ll probably frantically switch between your newly-opened 72-tab browser of information, and you may find yourself with decision paralysis — unsure of what your immediate next step should be. Whatever you do — please just start. Get moving. In any direction. You’ll figure out the details later. Nothing is supposed to be perfect on the first try! In fact, if you don’t look back on your older work and want to die a thousand small deaths, then you haven’t grown, and that’s a shame. Your old work should embarrass you because it shows you’ve leveled up! But if you’re someone who values their time and has the money to invest, you can start with a 1-hour consultation with me via Skype to analyze your blog and Instagram. And you can book me for that here! And while I’ve been blogging for 17 years, I also have a Marketing & Communications degree that’s given me a formal education on better branding and marketing strategies when it comes to business. I’ve seen a lot of people come and go in this industry, but the people that remain, are the ones that have invested in themselves. There’s also masterminds and mentorship. Yep, another shameless plug — I’ve started a female entrepreneur mentorship group for a more immersive and hands-on experience with branding and monetization, and you can sign up for more information here (Tanzania & Turkey are sold out). Any other things you guys are struggling with — please drop it in the comments below! Thanks for reading and feel free to share this article with your aspiring blogger friend! Disclaimer: Some of the links included in this article are — you guessed it — affiliate links! I think of it as a finder’s fee, for helping you navigate this online space. It comes at absolutely no cost to you, but every time you click on my affiliate link, you give a flat tummy tea influencer diarrhea. Think of it as a public service. So on behalf of everyone, we thank you. PIN me baby, one more time! Next post: Traveling While Black: So Where Are You Really From?